I search Etsy for all kind of things these days – but I realised while writing this that I’ve never seriously considered using Etsy to buy furniture. How wrong I was! It is a treasure trove, and especially for amazing nursery finds like this cradle. It makes sense, of course – if you want something truly unique, and with serious craftsmanship in its design, where else would you look? That’s how we came across this stunning hanging cradle from Woodly. This shop is definitely one to watch, especially if you are on the look out for nursery furniture with sustainability built in. The Roll hanging cradle can be hung from the ceiling or from a separately built stand. 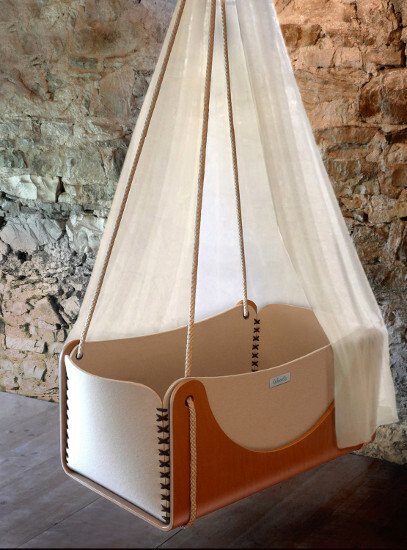 The strong cotton ropes which hold it allow the baby’s movements to gently dictate the motion of the cradle, which can rock in any direction, mimicking the movement of the mother’s body before birth. The outer frame of the cradle is a strong birch shell, with an inner layer of pure woollen felt which can be removed and washed. Not only has it been constructed sustainably, but when you don’t need it anymore, you can turn the birch shell upside down and it becomes a beautiful child-sized table. That’s forward thinking! 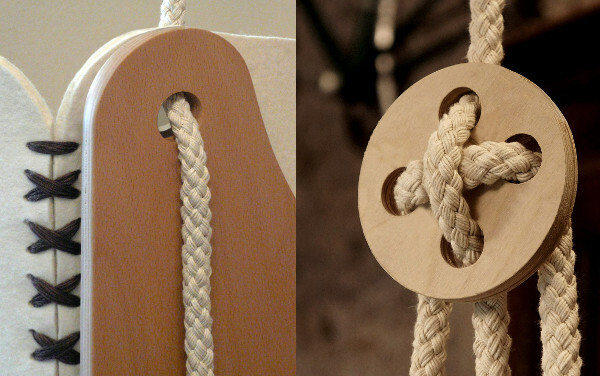 You can buy the Roll hanging cradle from Woodly for $848 – but here’s the downside – they only ship within Europe. But you know what? Etsy sellers are a lovely bunch, and I think it would be worth contacting them to see if they’d make an exception.